Beans, Rice & Life: Life's a Beach w/ Treats! Life's a Beach w/ Treats! 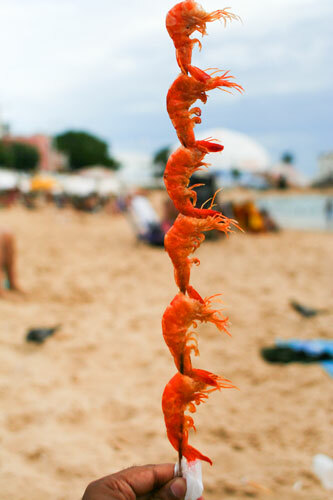 If you want to live like a true carioca (native of Rio), you gotta know Rio beach food. Rio de Janiero has one of the most beautiful beaches in the world- soft sand, beautiful warm water, and of course great food! What could make any beautiful beach day better? BBQ!!! 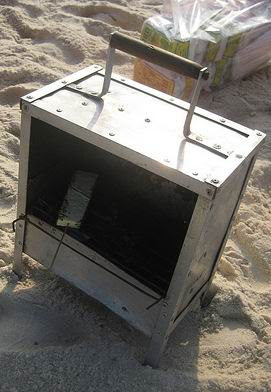 Food on a Stick: Beach vendors go around w/ with hand held charcoal grills in one hand (above) and a cooler filled with either meat, cheese or shrimp on a stick and grill your food right there on the spot-- Ahhh, the life!!! Nick being the Baltimorian that he is was overjoyed to discover the matte man. 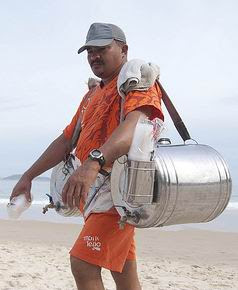 A guy walks up and down the beaches with 2 ice cold kegs- one filled with iced tea (or matte) and the other filled with lemonade. For R$2 (or US $1), he lets you fill up whatever proportion of half-and-half (or Arnold Palmer) you prefer.